One popular and widely use of augmented reality based application, is the projection of points of interests on top of the phones’ camera view. 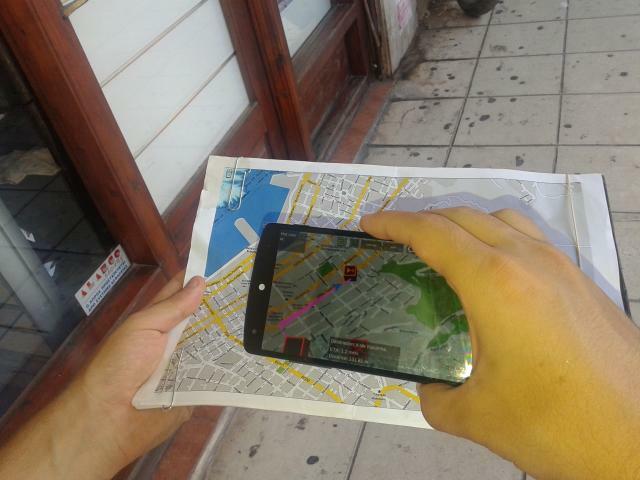 In this paper we discuss the implementation of an AR application that acts as a magic lens over printed maps, overlaying POIs and routes. This method expands the information space available to members of groups during navigation, partially mitigating the issue of several group members trying to share a small screen device. Our work complements existing literature by focusing on the navigation tasks and by using self-reporting questionnaires to measure affective state and user experience. We evaluate this system with groups of real tourists in a pre- liminary field trial and report our findings.